You want to get readers to trust you. You don’t want them to discredit your advice, and you definitely don’t want them to ignore what you have to say. Without your audience’s trust, your blog is worthless. But why should they listen to anything you have to say? You’re just an up-and-comer. Nobody knows who you are. Why should they listen to some stranger on the internet? Well, you must understand, most people who arrive on any website, whether it’s an established one or not, arrive on it for the first time. And an established site that you look up to will be completely unknown to many new visitors. That means they have to do the same work as you do to win their trust. In other words, if they can do it, so can you. First impressions don’t just matter in face-to-face interactions, they matter for your website. In fact, numerous usability studies have discovered that a new visitor to your website will decide whether to leave or stay within 7 seconds. They make a snap judgment based on what they see at first glance, and if you don’t look credible, they’ll leave right away. What a cluttered mess, right? You’d be gone in a jiffy. Instead, you want to shoot for a clean and simple design that looks professional. 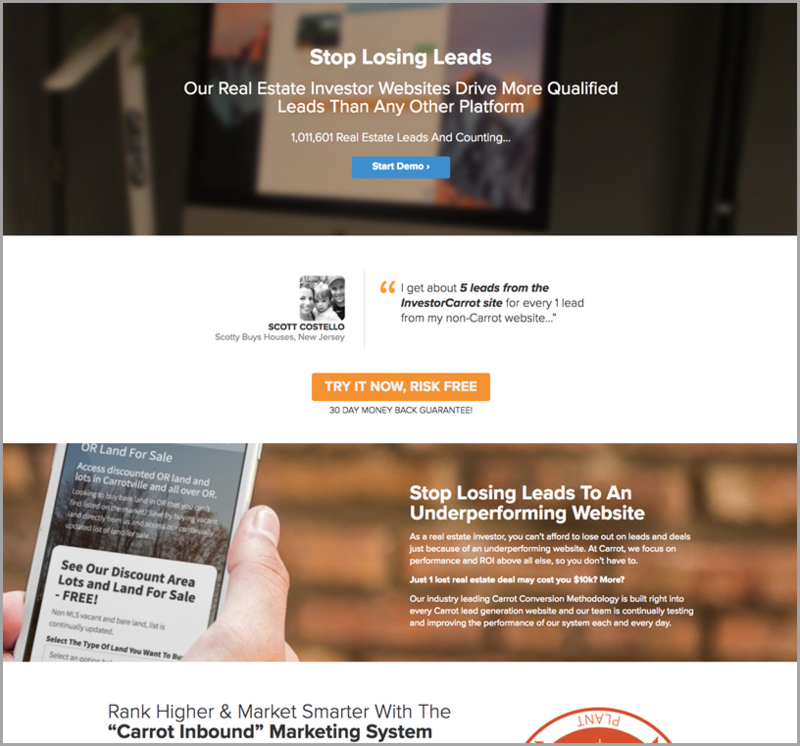 Plenty of space – You want to avoid filling up every nook and cranny of your website like the example above. Instead, each element of your design should have room to breathe. Make sure there’s plenty of empty space between text, images, buttons, etc. Clear, easy-to-read text – Don’t get cute with your font. Err on the side of basic and readable. And make sure the font size is large enough for people to read. 12px may have cut it back in 2012, but today, you need at least 16px. Responsiveness – We no longer live in an age where everybody reads your blog on their PC or laptop. Make sure your website is mobile-responsive. Elements in alignment – Misaligned elements look messy. Make sure every element of your design is aligned with the rest of the page. Consider using a grid. Straightforward navigation – the visitor should be able to instantly determine where they are – your homepage, your blog, your article – and what you have to offer. They should also be able to quickly spot your menu and navigate through your site. See how clean and professional these designs look? That’s what you want to shoot for. Well, luckily, you don’t really have to be. You can get a decent design simply by investing in a quality WordPress theme. Check out Elegant Themes and StudioPress. Once someone starts reading, you’ve won their trust for a moment, but the battle isn’t over. Now, you need to build their trust further. And one of the best ways to do so is by showing readers you understand exactly what they’re going through. Make them feel like you’re reading their mind and repeating their thoughts back to them. Show that you understand them and their struggles and you’ll build instant rapport with your readers, which makes them less likely to leave. After all, if you understand their struggles, you suggest that you either have dealt with the same struggles yourself, so you’d know how to get through them, or you’ve helped people with the same struggles before. Either way, the reader feels like your article will solve their problems. Consider, for example, how Sarah Peterson in 8 Old-School Blogging Tactics That No Longer Work starts her article. You can feel the empathy flowing from her introduction. It feels as though you’re sitting down by the fire with a close friend who knows every concern on your mind. And because of that, you don’t just trust them, you like them. Every writer promises something with each article. This article, for example promises to help you build trust with your readers. 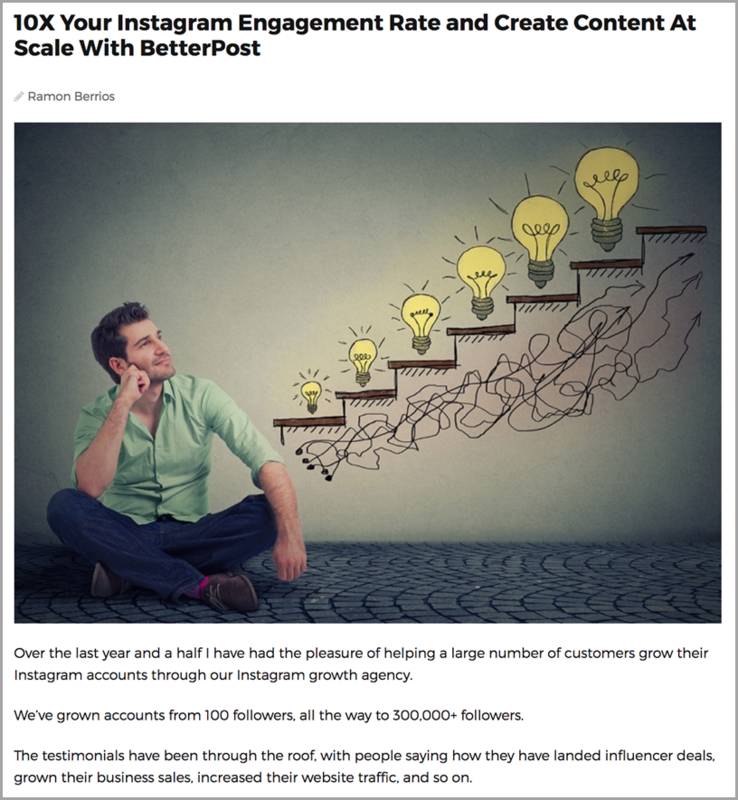 In 10X Your Instagram Engagement Rate and Create Content At Scale With BetterPost, Ramon Berrios promises to show you how to… well, ten times your Instagram engagement rate using BetterPost. It’s right there in the title. But more important than making a promise is the ability to back-up that promise with compelling information. Many assurances made in blog posts amount to absolutely nothing. They’re simply the sad unlikely promise of a writer who wants you to read their content. 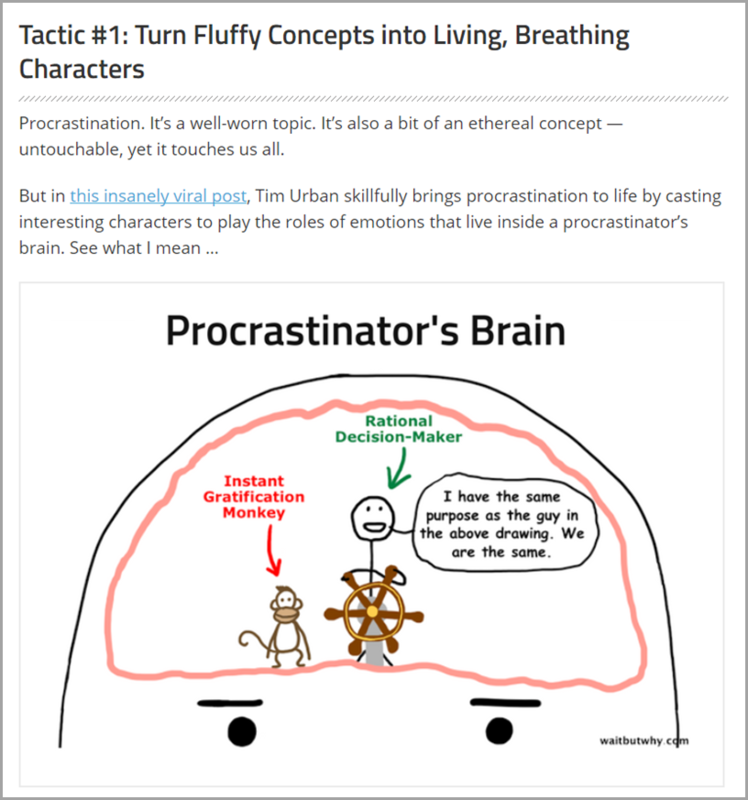 The writer doesn’t actually know if the tips they propose will work, but they pretend like they will. And the bigger problem for that over-ambitious writer is that readers are able to see right through that deception. In other words, a promise is only as good as its practicality. In the above piece, for instance, Ramon Berrios uses his own Instagram credibility to backup the promise he’s making. If you don’t have your own trust-building story, though, don’t worry. You can also use expert quotes like Sonia Thompson does in 10 Tried And True Tactics For Getting Your First Coaching Client. Or include the story of a specific person who’s reaped the benefits of your promise. 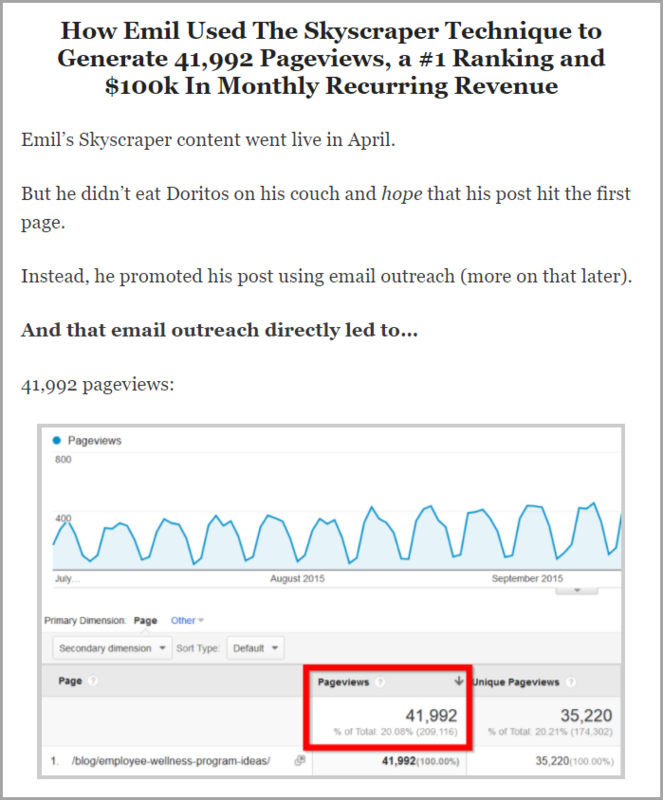 Brian Dean from Backlinko does this in White Hat SEO Case Study: How To Get a #1 Ranking. Using expert quotes, case study examples, and telling a story about your own success are all great ways to backup your promises and thus build credibility with your readers. If you don’t take the time to show people why they should trust your promise, they’ll assume you’re just blowing steam. Building trust in large part comes from building a connection. The more connected a reader feels with you, the more likely they are to trust you. And readers don’t connect with words on a screen. They connect with other humans. That’s why your words need to show you’re a living breathing person just like them. 1. Write like you’re talking to your buddy. Stilted, overly formal writing creates a barrier between you and your reader. The more you can make them feel like they’re interacting with a friend online, the more connected they will feel to you. Consider Amanda Zantal-Wiener’s, We Need To Talk About Uber. With the friendly, casual tone, Amanda makes her readers feel like they know her personally, not as some random online author. It reads almost like an e-mail you’d receive from a friend, and that’s the kind of tone you want to hit. 2. Sprinkle relatable details throughout your writing. You never want to make your blog posts all about you, but that doesn’t mean you should never reveal anything personal. In fact, even the smallest snippets of personal information can help you build rapport with your reader. Not every blog post requires a personal story, but you can usually sprinkle in the odd reference to your day-to-day life – when it makes sense to do so. To me, broccoli is delicious. To my kid, it’s not. Different markets want different things. See how this instantly humanizes her in your eyes? She gives you a glimpse into her personal life, and anyone who’s had a kid who wouldn’t eat their veggies – i.e. anyone who’s had a kid – can relate to this. It creates an instant bond. Nobody’s perfect, so don’t be afraid to open up about flaws you have or mistakes you’ve made. You’ll actually make your readers feel like you’re an honest person. And if you’re honest about your mistakes, you’re probably honest about the rest as well. By being honest about his own mistakes, he shows a willingness to look imperfect – like he’s a regular guy, not some sleazy marketer trying to impress you. Another good way to build credibility is to backup your points with examples. After all, if you just tell someone what to do, they’d have to take your word for it. If you show them an example of someone else doing it, this lends social proof to what you’re saying. You didn’t just make it up. You actually did research and based your suggestions on strategies people are actually using. But showing examples will also make your suggestions more concrete for the reader. Rather than an abstract idea, now they can see it in action and experience its effect. Few things are more convincing. Just look at the post you’re reading now. I backed up each of my suggestions with a clear example that shows it in action. Doesn’t this make you feel more confident that our suggestions would be effective? No matter how convinced you are that you’re correct in your declarations, readers still have objections. In fact, addressing those objections is exactly how you gain the trust of skeptical readers. However, the difficulty doesn’t lie so much in addressing objections, but knowing what objections are going through the reader’s mind and when to bring it up. In her post Social Media Marketing Vs Social Media Advertising: Who Will Win the Social Traffic Game in 2018?, Kim Smith expertly guides the reader through any concerns that they might have. To play and win the game, you must know the rules of the game. So, let’s understand how social algorithms work to get maximum organic social traffic to your website. Easy to say, difficult to do! Understanding the working mechanism of social algorithms is not a piece of cake. The algorithm for each social platform works differently. For instance, on Facebook, a core factor that affects the rankings of a post is its relevancy score, whereas on YouTube the total watch time of the video per session decides whether a video enters a ‘Recommended Video’ section or not. 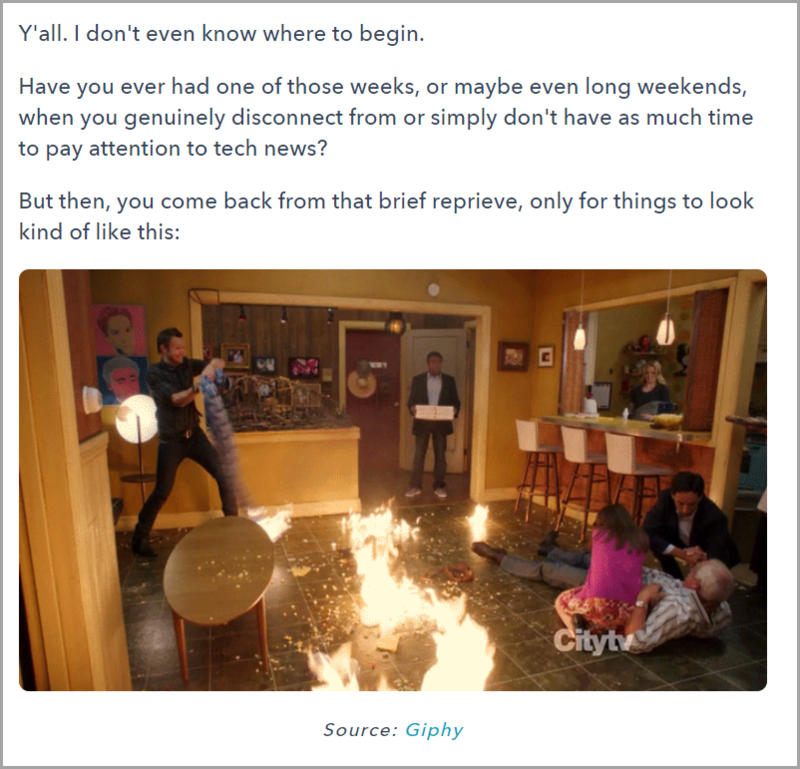 To add to the woes of social marketers, engineers update these social algorithms from time-to-time; making it next to impossible for social marketers to keep track of each and every social platform’s algorithms on a regular basis. By describing the objections of the reader in detail and then addressing those objections, Kim informs the reader that she knows what they’re thinking and she’s not going to ignore their concerns. Not only does this build trust because you’re being empathetic to the reader’s opinions, but you are also directly addressing their objections to your content. But how do you know when the reader has a qualm with your claims? Look at your headline and think through all of the doubts and objections that a reader will have with the promise you’re making (write these down if you like). Read through the article section by section and consider whether any points you make might raise doubts and objection. If so, address them. If you want to take it one step further, have a friend read your post and ask them to let you know when something raises doubts with them. With that, you’ll be answering objections and building trust in no time. 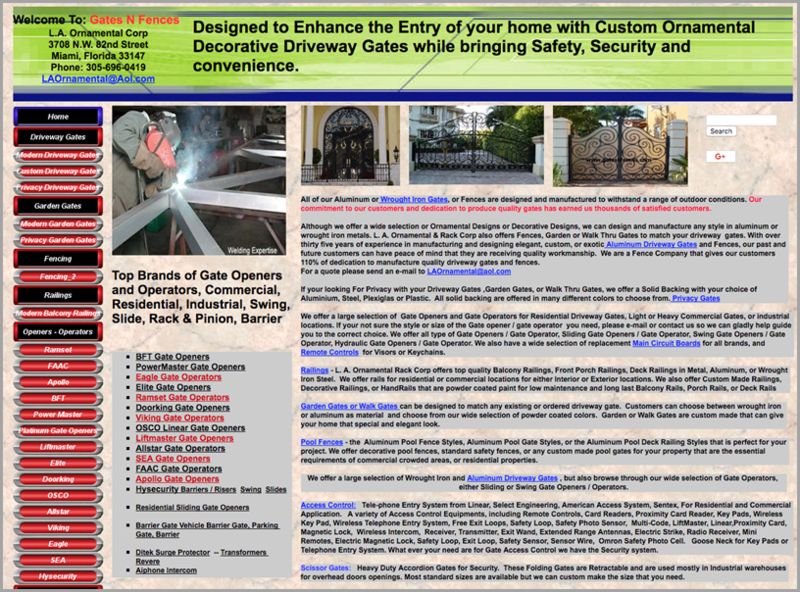 You visit an article on a website that has a particularly large audience. The content intrigues you so you read through the whole piece and get to the bottom. You notice the comment section where over 100 people have left some commentary. And what do you notice next? The author is actually responding to these comments. Maybe not every comment, but a good portion of them. How does this affect your trust for the website and the author? If you’re like me, it strengthens it. It tells me that the author is (1) confident enough about their stance to stick around and answer questions, (2) personable enough to engage with their audience, and (3) empathetic enough to give a crap about their audience’s opinions. You can create this same effect by showing your face in the comments section. Courteously respond to comments, thanking people for reading and commenting on your article. Even when those comments disagree with your stance. 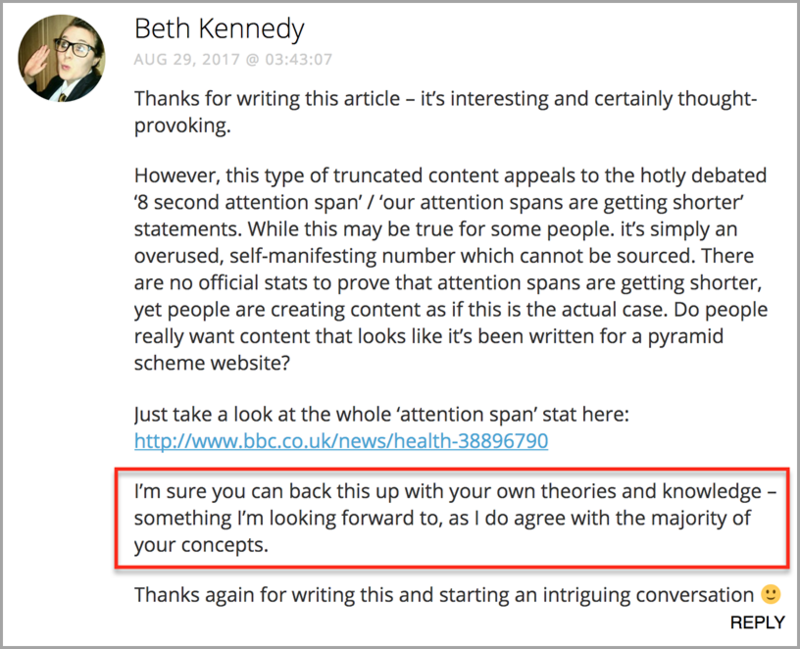 In one article I wrote for Smart Blogger, I received this comment from Beth Kennedy. As you can tell, she disagreed with my opinion on multiple points I brought up in the article. I responded explaining that perhaps it’s not so much that our attention spans are shorter, but our options for content are greater. In other words, since it’s easy to find great content, lesser content quickly loses its hold. Here was her response back. With a single thoughtful comment to a contrary opinion, I gained trust. Not because my response was perfect or my writing was incredible, but because I actually took the time to respond. Not enough writers do that. Which is why you’ll stand out when you do. Whether you’re an up-and-comer or you’ve been blogging for a while, building trust with readers is endlessly important. Without building trust, they will not give you their emails, and they certainly won’t open their wallets to buy your products and services. So you need to build that trust if you want to see them become subscribers or clients. And anyone can do it, whether you’re a pro or a newbie. You just have to tick the right boxes. Follow the seven principles you just learned, and you’ll be off to a good start. 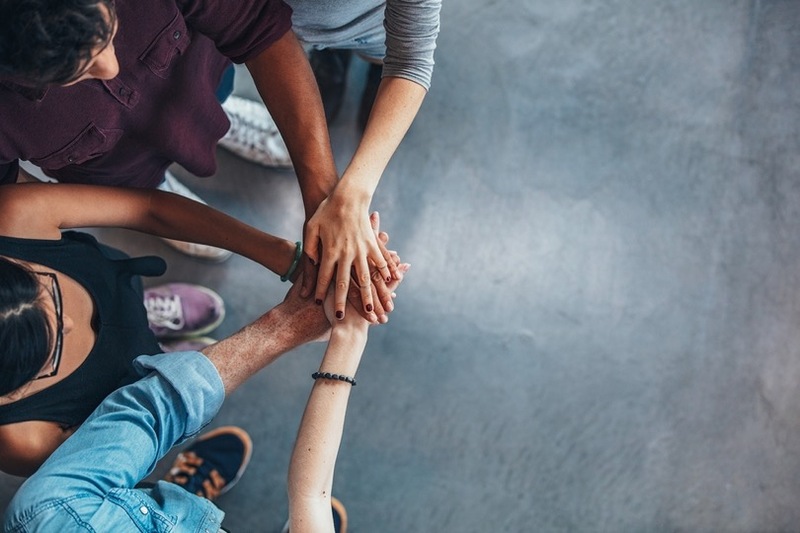 The post How to Get Readers to Instantly Trust You (Even if They Have No Clue Who You Are) appeared first on Jeffbullas’s Blog.